Victor Herbert (b Dublin, 1 February 1859; d New York, 24 May 1924). The grandson of Samuel Lover, the novelist, portrait painter, author of such Irish songs as ‘The Low-backed Car’, ‘Rory O’More’ and ‘Molly Bawn’ and of several pieces of musical theatre (The Happy Man, Il Paddy Whack in Italia), Herbert was born in Dublin, but brought up and educated in Germany. He began his musical career as an orchestral ‘cellist, and became a member of the Court Orchestra in Stuttgart, but in 1886 he left Germany for America, where his wife, vocalist Therese Förster, had secured a contract at the Metropolitan Opera House. Herbert worked in New York as a ‘cellist at first at the Metropolitan and then elsewhere, as musical director at Koster and Bial’s (1887) and with Locke’s American Opera Company (1887), before making himself a place in the musical world as a popular conductor of classical works and a bandmaster. In 1894 he became Regimental Bandmaster of the 22nd Regiment Band, New York. Herbert’s earliest compositions were in the form of classical and light classical orchestral and instrumental works, and, although he contributed pieces of music to Charles Hoyt’s musical play The Midnight Bell and other such shows, it was some time before he turned his attentions to the musical theatre. His first extended lyric work was, in fact, an oratorio, The Captive. His initial full score for the musical theatre, the comic opera La Vivandière, was submitted to Lillian Russell, but it was rejected and never performed. 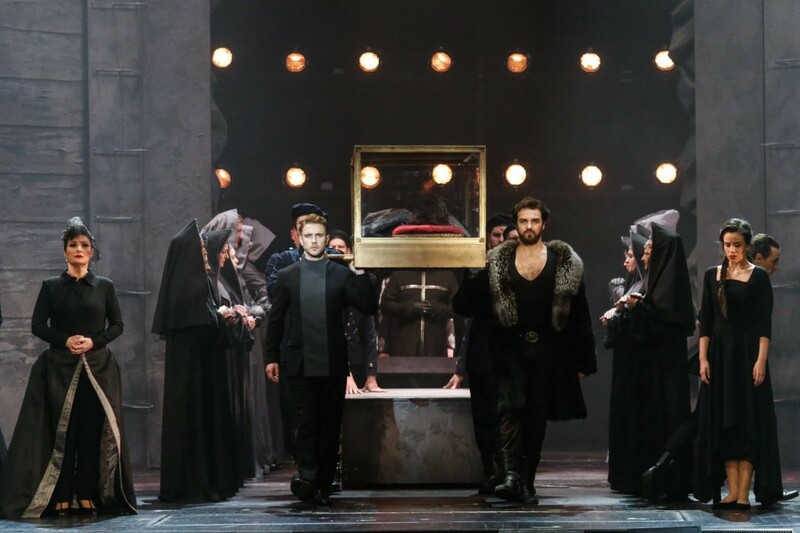 Thus it was the composer’s second effort, Prince Ananias, produced in 1894 by the Boston Ideal Opera Company and played in their repertoire in that Broadway season (55 performances) that introduced him to the New York stage. Having arrived on Broadway, Herbert and his music were rarely long away from its theatres during the rest of his considerable career. Over the next 30 years Herbert composed a long list of musical scores for the theatre, scores ranging from burlesque to romantic operetta and to the light-hearted dance-and-song pieces that subsequently became the popular musical theatre fodder. He scored a number of fine successes, but also a large number of flops — flops which were, it must be emphasised, not always such because of any lack in their musical content. In the process (and also in hindsight) he became regarded as the most important figure in Broadway’s composing fraternity in the first decades of the 20th century. After the modest beginnings made with Prince Ananias (which nevertheless remained three seasons in The Bostonians repertoire and twas given more than 300 performances in all) Herbert quickly found success when his next work, the burlesque comic opera The Wizard of the Nile (`Star Light, Star Bright’), was given a fine 105 performances on Broadway. It went on to productions in Britain and on the Continent — a rare thing for an American work of the period — and to a revival in New York. It was an impressive beginning, but the international record compiled by The Wizard of the Nile was one which, amazingly, none of Herbert’s later shows would ever equal. In spite of occasional showings abroad, even his greatest successes in the musical theatre were successes only within the United States. A farcical piece called The Gold Bug foundered in a week on Broadway, and favourite soprano Camille D’Arville’s self-starring production of his Peg Woffington failed to make it that far, collapsing in Philadelphia before its scheduled opening, but in the same year, 1897, Herbert scored his second important success with the romantic comic opera The Serenade (`I Love Thee, I Adore Thee’), again produced by the Bostonians. This more musically substantial work was followed by two further pieces which had good lives — another burlesquey vehicle for The Wizard of the Nile star, Frank Daniels, called The Idol’s Eye (`The Tattooed Man’), and a piece commissioned by Serenade star, Alice Nielsen, with which to launch her own company. 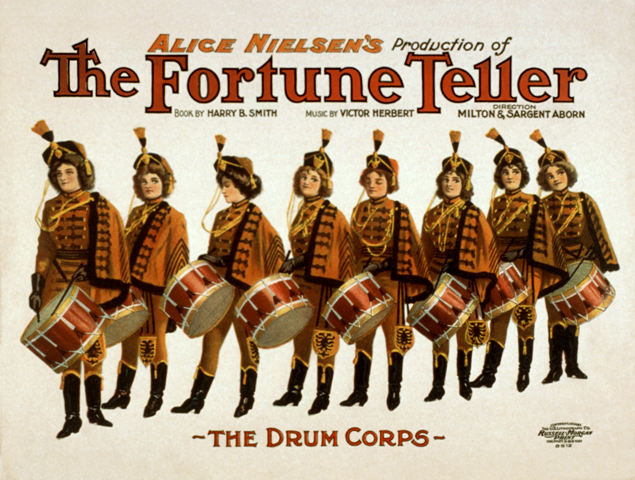 The Fortune Teller (`Slumber On, My Little Gypsy Sweetheart’) served Miss Nielsen well in America and in a season in London’s West End, and confirmed its composer’s now pre-eminent position in American comic opera. Herbert’s rate of writing thereafter became demential. 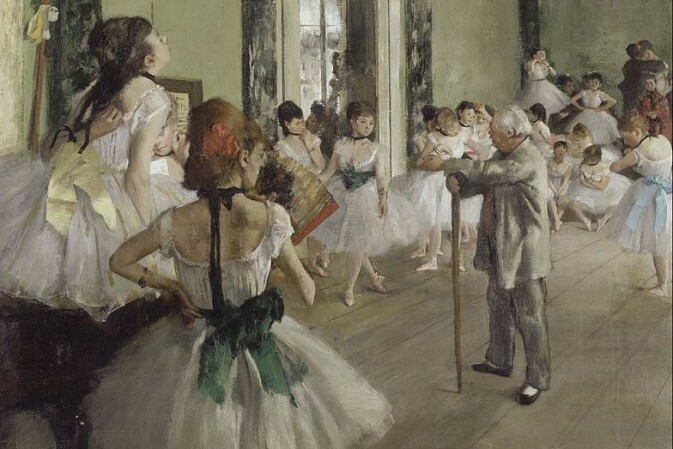 In a period of little more than seven months in 1899-1900 he had four new works premièred. It was, perhaps, a salutory warning that none came near the best of his earliest pieces in popularity. An attempt to wed comic opera and burlesque in a version of Cyrano de Bergerac for Francis Wilson and Lulu Glaser was a 28-performance flop, but another piece for Miss Nielsen, The Singing Girl, while not coming up to the standard of The Serenade or The Fortune Teller, served its star for a while in New York (77 performances) and on the road. A fresh work for Daniels, this time cast as The Ameer, did better on tour than in New York, and The Viceroy, another piece written for the Bostonians, also had an indifferent life. After this burst of composing activity Herbert disappeared from the bills for a while, fulfilling a three-season contract as conductor of the Pittsburgh Symphony Orchestra and of a season at Chicago’s Grand Opera House. He did not return to Broadway until 1903, when he was commissioned to provide the score for a grandiose musical extravaganza produced by Julian Mitchell and Fred Hamlin. Babes in Toyland was a fairytale spectacular which was designed specifically as a Broadway entertainment and not, like virtually every other one of Herbert’s works to date, as a vehicle for a touring company or star. Lavishly staged, as a successor to the producers’ previous The Wizard of Oz, it turned out to be a splendid success, and Herbert’s score rendered up several pieces which have long remained popular in America (The March of the Toys, ‘I Can’t Do the Sum’, ‘Toyland’). The comic opera Babette, with ex-opera star Fritzi Scheff starred in its title-rôle, won only 55 Broadway performances, but Herbert scored a fresh success the following year with another commission from Hamlin and Mitchell (teamed this time with producer-star Lew Fields), when he composed the score for the Ruritanian musical comedy It Happened in Nordland (`Absinthe frappé’). It ran long into 1905, joined by two further Herbert shows, Miss Dolly Dollars and another fairytale piece which had started out in Chicago as Alice and the Eight Princesses but which reached Broadway, with Alice having been excised from the action and seven new songs shoved in, as Wonderland (73 performances). Both of these had only a moderate New York run, but a regular touring life. This time the high rate of activity to which he had returned did not seem to have any adverse effect on the quality of Herbert’s scores. His third new work of 1905, again a vehicle for Fritzi Scheff, cast her as Mlle Modiste (`Kiss Me Again’,’I Want What I Want When I Want It’) with great success, whilst his first score of 1906, written for a blatantly low comedy musical, as opposed to the Frenchified light opérette of the previous show, brought him an equally fine success in The Red Mill (‘Moonbeams’, ‘The Streets of New York’, ‘Every Day is Ladies’ Day with Me’). Each of these two very differently flavoured pieces remained a favourite for decades in America, and the two proved themselves to be amongst the most durable of Herbert’s works. It was, however, a few years and rather more shows before such success came again. Herbert continued to turn out scores of all kinds, ranging through a rather classy burlesque on Lohengrin (The Magic Knight) for Joe Weber, a free-wheeling bit of low comedy for Daniels (The Tattooed Man), a farce comedy starring Emma Carus (Too Near Home), a spectacular children’s show based on the comic strip Little Nemo, a fine romantic musical score (‘Rose of the World’) to the underloved comic opera Algeria (later The Rose of Algeria), a disappointing The Prima Donna for Fritzi Scheff, and a short-lived Lew Fields dialect comedy show, Old Dutch, without notching up another major hit. In 1910, however, he hit the heights once more when he provided a score for another refugee from the world of opera, Emma Trentini, as Naughty Marietta. The show scored a fine success in America, and its title and songs (‘Ah! Sweet Mystery of Life’, ‘Neath the Southern Moon’, ‘I’m Falling in Love with Someone’, ‘Tramp! Tramp! Tramp!’ etc) later won worldwide recognition with the aid of the cinema. Herbert kept up a resolute and regular output through the 1910s. The light musical comedy When Sweet Sixteen proved to be more to the taste of the provinces than the city, but The Duchess, another piece modelled around Fritzi Scheff, and of which enough was expected to have it tried out in a copyright performance at London’s Ladbroke Hall (as The Rose Shop), went through out-of-town agonies as its star abandoned ship before Broadway proffered its thumbs down. The Enchantress (`The Land of my Own Romance’, `I Want to Be a Prima Donna’) also played only a medium season on Broadway (72 performances) but, like several other Herbert shows with similar metropolitan records, it lived out a good and highly profitable life on the touring circuits, where in most years several of the composer’s works could be seen and heard, going round the country for the first, second, third or umpteenth time. The composer’s voluminous and ever-rebounding career soon brought forth a number of further successes. Montgomery and Stone, whom Herbert had served so well in The Red Mill, had a fine run with the Cinderella tale of The Lady of the Slipper, and another Ruritanian operetta, Sweethearts (‘Sweethearts’), in spite of a cute, confused and confusing libretto, played 136 performances in New York and proved to have more staying power than some of Herbert’s other and better pieces in the same vein. The Madcap Duchess, accounted a little too musically ambitious by some, failed to catch on, but the musical comedy The Only Girl, composed to an adaptation of Ludwig Fulda’s Jugendfreude done by Herbert’s most appreciable collaborator, Henry Blossom, gave him one of the longest Broadway runs of his career (240 performances) as well as one of his rare British productions. Herbert paired with Blossom again for the pretty The Princess Pat (‘Love is Best of All’), the Ziegfeld revue The Century Girl (with Irving Berlin), the Irish light opera Eileen, and a version of a Frederick Jackson farce, A Full House, which had started out in Boston with a score by Uda Waldrop and the title She Took a Chance, but ultimately arrived in New York as Herbert’s The Velvet Lady. From this group Eileen brought him the most praise, for its pretty Irishy melodies and superior concerted music. He worked on a second Ziegfeld revue, Miss 1917, but several other pieces to which he provided music proved poor stuff, and the resultant shows had short Broadway lives. In 1920, for only the second time in nearly 30 years of composing, a Victor Herbert show closed on the road. The small-scale Oui, Madame, announced as the show which would revive the George Edwardes kind of musical, underwent some last-minute efforts to gussy it up to more conventional proportions with Ned Wayburn girls, glitz and dances, when its producers lost their ‘small-scale’ nerve, but it still went under without making Broadway. His 1919 Angel Face, a curious modern musical comedy with a plot about monkey-glands, had to fight its way to some kind of success through strikes and lockouts, but there was a real disappointment when Fred de Grésac made over her elegant play La Passerelle as what should have been an ideal Herbert libretto. Orange Blossoms (1922, ‘A Kiss in the Dark’), the last Herbert musical produced in his lifetime, played only 95 times in New York. The composer was represented once more, posthumously, on Broadway when The Dream Girl, a musical version of the reincarnation play The Road to Yesterday, played 117 performances for the Shuberts without establishing itself or its songs amongst Herbert’s best. Amongst Herbert’s other dramatic compositions were two operas, Natoma (1911) and Madeleine (1914), and incidental music for the accompaniment of silent films. The popularity ultimately won throughout the English-speaking world by the songs from Naughty Marietta would seem to indicate that Herbert’s music should have had an appeal reaching beyond America, but apart from The Wizard of the Nile, Miss Nielsen’s touring season of The Serenade, two unsuccessful attempts at The Red Mill, a production of The Only Girl and a handful of performances of Angel Face, the only Victor Herbert score to have been heard in London’s West End was a musical melange of The Serenade and The Fortune Teller, originally produced on America’s west coast as Gypsy Lady (George Forrest, Robert Wright/Henry Myers, Century Theater 17 September 1946), which briefly played on Broadway, and in Britain as Romany Love. Australia proved no more enthusiastic – although The Fortune Teller was given a brief showing there – and only The Wizard of the Nile seems to have penetrated into Europe. It must remain a mystery why Broadway’s acknowledgedly most appreciable, versatile and prolific composer of the turn-of-the century years failed to `travel’, leaving what overseas laurels there were to be won and the position of international flagbearer to the era’s American musical stage to the less appreciable Gustave Kerker and his loose-limbed Belle of New York. 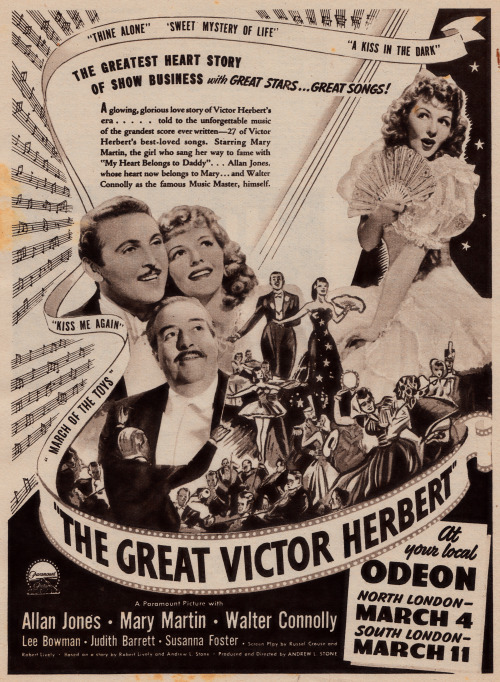 A Hollywood film, The Great Victor Herbert (1939), which had little or nothing to do with the composer or his life story, had Walter Connolly starred as Herbert. And “Mlle. Rosita” ? Book by Joseph Herbert, published in 1911 by Witmark.